Just last week I mentioned that context has an inescapable impact on the sandwich. How it looks, the surrounding atmosphere and our own expectations all influence how we feel about a particular sandwich. That may not be fair to the idea of sandwiches in and of themselves, but we never eat sandwiches in and of themselves. We eat them in the real world. Some may consider me boorish for it, but I feel obligated to talk about price. The sandwich above retails for $7.95. Now, I’m no country mouse. I’m not at all categorically opposed to paying $8 for a sandwich, provided I get $8 worth of sandwich to enjoy. Sadly, at Caffe Frascati that simply wasn’t the case. I try to sympathize with people trying to make it in an industry that’s ruthless in the best of times, but this is a cafe and not a charity. 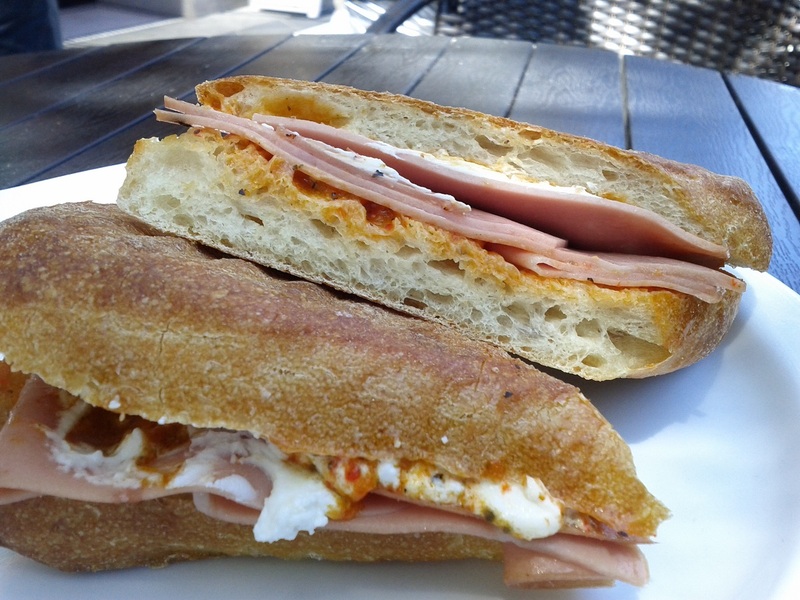 This was a sandwich with a lot of potential, tangy goat cheese and subtle flavors working together, but with scant few slices of mortadella and the thinnest application of red pepper pesto the whole thing just failed to come together. I can accept a failed sandwich, but it’s hard to be satisfied with a failed $8 sandwich where those eight dollars ended up everywhere but on the plate. This entry was posted in Sandwich Reviews and tagged Reviews by Pete, San Jose by Pete. Bookmark the permalink. The bread looks a little too firm and chewy for the ingredients. There was quite a bit of seepage with the cheese, but there wasn’t enough mortadella for it to matter one way or the other. The toasting helped quite a bit, as it usually does, shifting a good amount of chew to crisp.